Medieval times books for kids are a great way to get children interested in medieval history. Full of beautiful illustrations of castles, knights and descriptions of what life was like in the Middle Ages, they can spark an interest in history and in the Middle Ages. We have selected three books that are all illustrated, the first one is for younger children starting from age 4 (A Medieval Feast), the second one is for children starting from age 8 (Medieval Life) and the third one is for older children from ages 12 and above. A Medieval Feast is a wonderful book designed for children ages 4 to 8. Even though it tells a beautiful story of a lord and lady and their servants preparing the manor for the arrival of a King ("the feast"), it is a non-fiction book that gives children a glimpse of what life was like in medieval times. For example, it tells about the foods that were eaten in these times, the architecture, the countryside, how people were dressed, the medicines that were used, etc. It contains beautiful illustrations which makes it also a wonderful picture book to have at home. 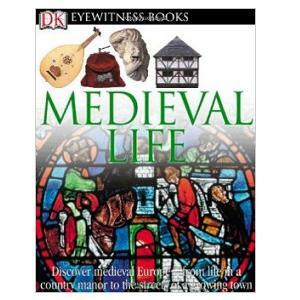 Medieval Life by DK Eyewitness Books (ages 8 and above) is a book that also contains a CD and a poster (for the child's bedroom). It is easy to read, packed with information and it covers medieval times from the Dark Ages to the Renaissance. It gives children an idea of what life was like in the countryside but also in the cities and how society was divided (between the nobles and peasants). The illustrations and photos are engaging and the book contains lots of interesting facts about clothing, weapons, music, buildings, etc in the Middle Ages. The Middle Ages: An Illustrated History is for older children (ages 12 and up). The story covers in great detail 1,000 years of history from the sacking of Rome, to the Frankish Kingdom, the spread of Christianity and the Crusades, and wars and battles that plagued this period and ending in the 15th century. The book covers historical figures such as Charlemagne, Joan of Arc and King Henry. It also accurately describes what life was like not of only for the nobility but also for the peasants and monks. The books is also full of beautiful illustrations, photos, documents and maps.